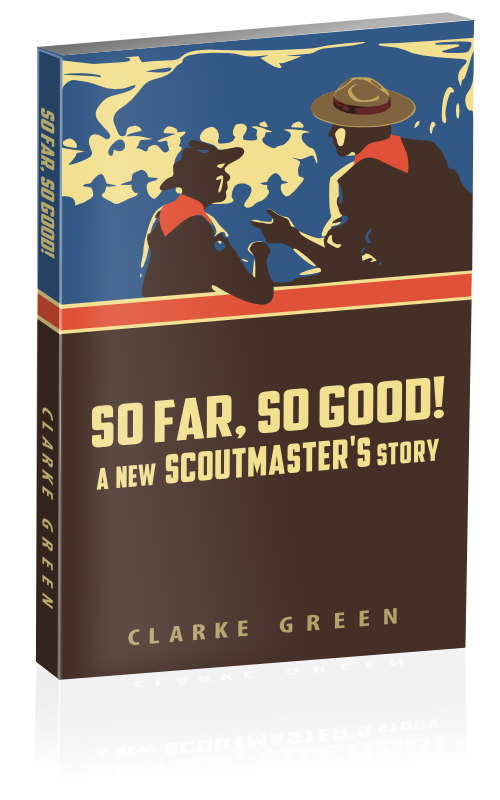 A must read for new Scoutmasters. After reading this I now know I am not alone and it helped reassure me that everything will be ok. I wanted to take a minute to say thank you. I am the new Scoutmaster of my twin sons troop. Troop 86 in Pinole California. After a rough day I sat back with “So Far, So Good!” and read it cover to cover and really enjoyed it. The book makes me feel better about the position and direction of Troop 86. I have already started to try some of the things mentioned as I had read the first few chapters on the web. Thank you for your insight into this new adventure in my life and the scouting careers of all the Scouts in Troop 86.
over the past few months I’d be a rich man! Chuck’s story reflects some of my own experiences, stories shared by readers and listeners, questions they have asked, and the advice I commonly share in reply. Like any new Scouter I was, at first, concerned with the obvious, what we did at meetings, where we were going camping, how we would get there, and what we would do once we arrived. With a young man’s audacity and overconfidence I tried to imitate the slickness and regimentation I envied in some troops. I imagined myself leading an orderly column of Scouts on parade, and having folks tell each other what a great guy I was. I was anxious to look the part. I bought a campaign hat and a red jacket, and admired the patches and decorations other Scouters wore. None of those things made me a better Scouter, and some of the attitudes I adopted made me insufferably self-important. Eventually I became much more interested in doing actual good rather than just looking the part. I wanted to be useful rather than simply chasing the appearance of success. I began to ask myself how, exactly, this game played in the outdoors benefitted young people. What could I do to make the most of my opportunity as a Scouter? Some of the answers came from older, more experienced Scouters, some from the Scouts themselves, some from working through my many mistakes and missteps; but the real revelation was stumbling on the writings of Scouting’s founder, Robert Baden-Powell. B-P had a knack for getting at the heart of things. His brief, but meaningful “Aids to Scoutmastership” is required reading for any Scouter. Ten years ago, I started writing a blog at ScoutmasterCG.com. I gained a small readership, and started fielding questions. I struggled to write clearly and offer useful advice. I finally hit on the idea of telling a story to illustrate what I have come to understand about over the past three decades. What would I do if I had the chance to start all over again? What if I knew then what I know now? Most of our training courses and official literature present an idealized, sanitized, and artificial picture of Scouting. We’d all like to think Scouting is like the images we see in Norman Rockwell paintings; but being a Scoutmaster means working with real people. Real people argue, Scouts misbehave, parents overreact, Scouters get discouraged, and little goes as smoothly as those idealized images would have you believe. After some years, I stopped trying to imitate an idealized picture and started helping Scouts discover authentic Scouting for themselves. We all stand on the shoulders of just over a century of Scouting’s combined experience. There are no new problems; we all encounter the same challenges, and all of us muddle through as best we can. I lay no claim that what you’ll read is the only authentic way of doing things, or even that I am close to having everything right. Troops are like families, they have different ways of functioning, their own quirks and traditions. So long as Scouters do no harm, I think any child can get a lot out of being a Scout. This narrative loosely follows my own experiences, but the new Scoutmaster in the story begins knowing things that took me many years to understand. All the names are altered, but there are enough clues here and there that some of my old Scouts and fellow Scouters may recognize themselves.I wrote it with the hope you’ll find it useful, and inspire you to discover something more about the spirit of your work as a Scouter.